The Unity Future Business Leaders of America did outstanding at this year's Regional Leadership Competition on February 3, 2018. Three of the seven competing students are advancing to the State Leadership competition in April! The three advancing include; Hallie Allen and Natalie Albrecht who will be competing at the state level together in the "Public Service Announcement" competition. As well as, Sophie Albrecht who will be competing in Impromptu speaking. 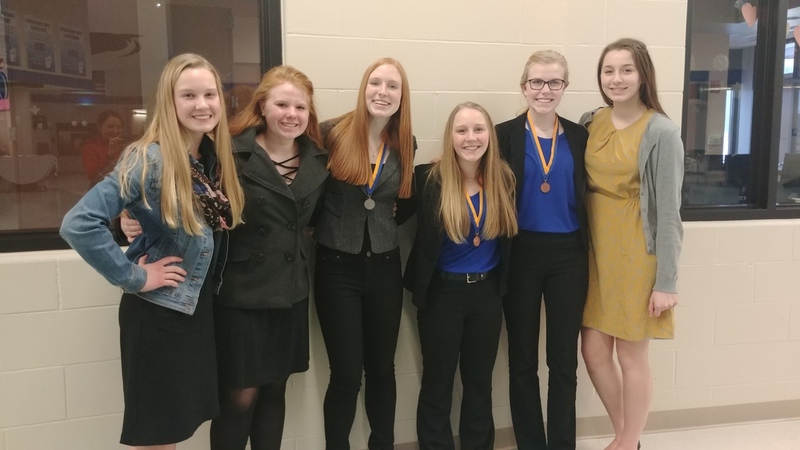 Other successes of the day's events include Mackenzie Anderson who placed 6th overall in the Social Media Campaign and Sydney Horgan, Bekah Robinson, and Myah Nelson who finished 7th overall for their work in the Broadcast Journalism event. It is truly inspiring to watch these young women develop amazing leadership skills! Way to go FBLA!